You do have some options for buying frames for your collectible ephemera. Listed below are why I believe that thePaperFramer is the best choice for you. There are other products that compete with some, but not all, of my products. Most of these are mass produced products that don't allow customization. Some sellers will tell you that their frames will fit a 'range' of sizes like 8 3/8" x 11 1/4". So what happens if your magazine is 7 7/8" x 10 7/16". It won't look good in the frame. Or what if you want to frame the first issue of Sports Illustrated which is 8 3/8 x 11 1/2". It won't fit in the frame above. Another seller sells a frame for newspapers that will frame newspapers up to 11" x 24" in size. Most current newspapers are 12 1/2" x 22", 12" x 22" or 11" x 21". The first two won't fit and the last one will have three inches of dead space. And if you want to frame anything older, newspapers were 13-14" wide in the 90s, 14-15" wide in the 60" and up to 18" wide or wider in the 40s and earlier. None of these will fit. 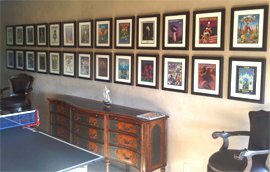 I custom make all my frames to the exact size of your collectibles. If you order 3 frames for newspapers that are 11" x 21", 13 1/2" x 23" and 15" x 24", you will get three frames that fit your newspaper exactly. No one else does this. Others either don't offer true customization or make it difficult to order. 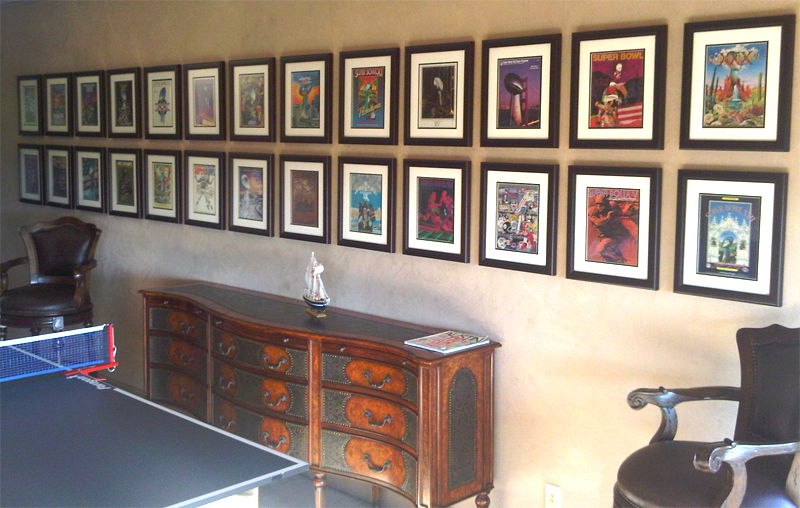 These are from a collector in Texas that has collected every Super Bowl program. Here on one wall are 26 of these framed with moulding #692, Coffee Brown. Almost all are just a little bit different. The height, width and thickness has varied over the years. Not a problem. Each were made to for the exact size. And if the owner wants to read one, each one is easily removable/replaceable. I wanted to store my catalog size comic of Superman vs Spider-man but it was too thick. While advertised for magazines, this thing could not hold anything more than a brochure perhaps made of 2-6 pages. The description does not explain this. Each moulding has a maximum thickness that it can hold. That thickness is shown on the page for each moulding. I can build frames for you for items from one page thick up to 1 3/8" thick. For a look at what is required to frame a thicker magazine look at Framing a Thick Magazine. No one offers more choices. The most mouldings, the most mats, the most acrylic choices and the most conservation options. However you want it framed, I can probably do it. I offer mouldings for your frames. Others give you no choice or a limited selection. I offer mats for your frames. Others give you no choice or a limited choice. Plus I offer the recommend sports colors for every major US Professional and College Teams. See all the team colors under 'Matboard' on the left menu. The acrylic that I sell is the best acrylic available for framing. Period. I offer acrylic from TruView/Cyro and Evonik which are the industry leaders for acrylic. The technical specifications for the acrylic I sell is on this site so you can read about the quality. If it isn't from TruView/Cyro or Evonik, it isn't the best. Framing Grade Acrylic is manufactured to a higher standard than other grades of acrylic such as acrylic for displays and signs and will have fewer flaws. Plexiglass is another name for acrylic. Lexan, a polycarbonate, and Styrene are not made in Framing Grade and are not the same quality as Framing Grade Acrylic. My acrylic uses Framing Grade thicknesses. Some use .040", 060" .080" or .098" stuff in their frames. I use .118" acrylic for all my frames. I offer the 4 major types of acrylic; Premium Clear Framing Grade Acrylic, Reflection Control (Non-Glare) Acrylic, UV Protective Acrylic and UV/NG Acrylic. Regardless of whether you are choosing a Changeable or Value Frame, I offer the most conservation options. Take a look at Conservation of Ephemera for more information. I don't limit my self to framing a single magazine or newspaper in a frame. Take a look at my Gallery for some samples of what I can do. I will also frame your newspaper or magazine article that spans more than one page. Take a look at Framing an Article for some examples. You are dealing with me and me alone. The only negative is that due to my hearing disability, I need to communicate by email and ask that you understand and work with me on this. I own and operate this site personally and have made and shipped thousands of frames since I opened in 2001. Your frames are made and shipped my me, a craftsman and framing professional who is also a collector and dealer of ephemera as well as being a Vietnam veteran. Your emails are answered by me. This site was written be me. I'm not a large impersonal company or a part time hobbyist. When you buy from me, you know who you are dealing with.